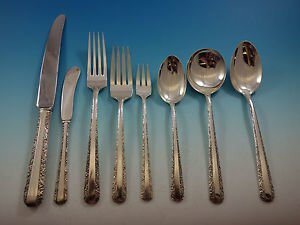 Exquisite Candlelight by Towle Sterling Silver Flatware set - 107 pieces. This set includes:12 Knives, 9 1/8"12 Forks, 7 1/4"12 Salad Forks, 6 1/2"12 Teaspoons, 6"12 Cream Soup Spoons, 6 3/8"12 Place Soup Spoons, 6 3/4"12 Cocktail Forks, 5 5/8"12 Flat Handle Butter Spreaders, 5 7/8"1 Pie Server w/stainless blade, 10 3/4"1 Gravy Ladle, 6 5/8"1 Serving Spoon, 8 1/2"1 Cold Meat Fork, 7 7/8"1 Sugar Spoon, 6"1 Pickle Fork, 2-tine, 5 7/8"1 Salad Serving Set w/black nylon, 11 1/2"1 Sauce Ladle, 6"1 Steak Carving Set, 2-pc, 9 3/4"Includes BONUS brand new storage chest. Excellent condition, with no monograms. This set will be beautifully professionally polished and sealed in individual plastic sleeves prior to shipping. 100% Satisfaction guaranteed!CLICK & shop our fabulous selectionof FLATWARE SETS!Due to the weight and cost of shipping the bonus wood chests, new tarnish resistant flannel rolls will be substituted for all International shipments. Free bonus chests are not included in International shipments of sets and we will instead include bonus free flannel storage rolls. Donatello by Amston Sterling Silver Grapefruit Spoon Fluted Custom Made 5 3/4"
D'Orleans by Towle Sterling Silver Grapefruit Spoon Fluted Custom Made 5 3/4"
Paris by Gorham Sterling Silver Salad Serving Fork Gold Washed Pierced 8 3/4"
Rose by Wallace Sterling Silver Cheese Plane with Flat Blade HHWS Custom 8 1/4"
Victorian by Durgin Sterling Silver Ice Scoop HH w/Stainless Custom Made 9 3/4"
Lexington by Knowles & Mount Vernon Sterling Silver Salad Serving Set 2pc 9 1/4"